NH3- and R723-applications are an emphasis of the open type Goeldner-Compressors. Beside pure ammonia R723, a mixture made of the natural refrigerants ammonia and dimethyl ether, is one of the most efficient refrigerants easily applicable at present. 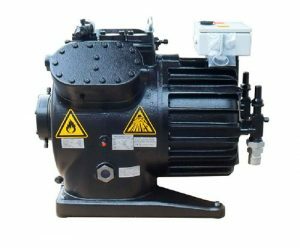 The open type 2- and 4-cylinder Goeldner-Compressor series, in a spectrum of 6…95 m3/h stroke volume are given free and available for ammonia (NH3) since 1993 and for R723 since 1998. In 2000 HKT realized the first R723-chiller for production cooling at the family owned facility.This means having best experience on that topic for two decades in a capacity range from 8kW to 400kW..